Current progress of our tropical food forest. Much work remains to be done amending and building the soil, and planting additional small plants. I want to first thank all those who have pioneered the way for growing forest gardens. Special thanks to Geoff Lawton, Robert Hart, David Holmgren, Bill Mollison and Sepp Holtzer. Their permaculture books and videos have been immensely beneficial even though our food forest is unique, as partially explained below. I also want to emphasize the importance of permaculture and encourage readers to learn as much as possible in order to develop more sustainable practices. A few weeks ago our land looked like bombs had blasted dozens of holes in the ground. Shortly afterwards the site turned into a giant muddy mess with all the rain we’ve been having. Fast forward a few weeks and things are now taking shape (although it’s difficult to capture good photos since the plants are still small). This project has been a lot of work and at the same time very rewarding. What we’re doing could feed our family organic healthy food for the rest of our lives as well as create some additional income from selling excess produce, and so the effort required is definitely worthwhile and then some. The actual planning and layout of the food forest has been one of the most enjoyable things I’ve ever done. Just like designing houses, I realize now there are infinite possibilities in designing forest gardens/food forests (also called mixed agriculture, agroforestry, etc.). A forest garden is not an orchard and it’s not a typical garden as most of our readers probably know. A forest garden is a self-sustaining mix of trees and garden that create a symbiosis with each other. Big trees shade smaller plants. Nitrogen fixing plants and other soil builders such as comfrey fertilize the soil. Neem tree leaves and other plants fend off pests naturally. Properly designed food forests need little or no watering, fertilizing, weeding, spraying, etc. once established. They’re much like forests in nature except only the most desirable/beneficial plants are chosen. Summary: We’re turning inexpensive, subsistence-level rice farmland into an extremely productive food forest. Every step of the way we’re doing things inexpensively. Here’s the cleverest part. We didn’t have to buy expensive fill dirt to raise the land. (That would have cost more than the land.) Instead, we dug large tree holes and filled them with lots of compost and topsoil. The tree roots only have to go down about 2’ before hitting good soil. When the tree roots hit the fertile soil and reach the water table, they should grow very rapidly and never need watering. The hard work of planting trees is over. The main challenge now is building soil quality on the surface. Our food forest specifications: We have six 4m wide x 17m long forest garden beds, one 2m x 20m raised bed along the driveway and one 4m x 20m tree belt next to the road. There are fruit trees and other types of trees and plants around the perimeter of the property. There’s also a small garden by the house and 3m x 12m shade house for plant nursery, potting and earthworm bed. 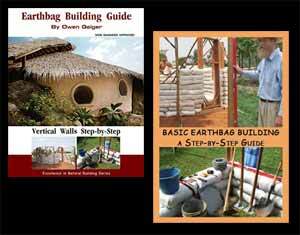 Our pump and garden tools are stored in an earthbag pump house that’s built just like an emergency earthbag shelter. Types of plants we’ve chosen: 1. what we like most (mangoes, bananas, moringa, papaya and other fruit trees, plus two or three dozen common veggies and herbs), 2. easiest, fastest to grow (it’s not practical to baby lots of delicate plants in a garden so large), 3. some wild/indigenous plants that take very little maintenance and add variety to our diet. 4. multi-purpose non-food plants such as insect repelling plants, medicinal plants and soil builders. Forest garden design: Everything we’re doing is an experiment based on what I’ve read and learned over the years. It’s a little different than a typical forest garden; it’s more a mix of ideas that work in our climate and suit our needs. There are numerous areas or pockets throughout the garden for experiments: trellised pole beans, papaya on mounded road base, hugelkulture mound, moringa ‘hedge’, cover crops between trees, etc. There are lots of temporary banana plants to help shade the main fruit trees through the long dry season that lasts about seven months. A combination of the long dry season and intense heat requires careful planning that includes selecting hearty plants, using lots of mulch in the dry season, and having a good well with water piping around the perimeter. Eventually the forest garden will need very little watering, but in the early years it will need irrigation. We might use drip irrigation or soaker hoses with some watering from a garden hose. How we planted our trees: Our land used to be a small rice field. Most trees and plants will not grow in a flooded rice field, and so we raised our land 24”- 30” (60cm x 75cm) with inexpensive clay subsoil. This also raised the site so we could build a recycled wood house and other structures. Trees (and other plants) obviously don’t grow well in heavy subsoil, so we dug tree holes 2’ wide x 24”- 30” deep (60cm x 75cm). We dug down until we hit the black soil of the rice field under the subsoil. The black soil was chopped several inches and then the holes were filled with a mixture of top soil, compost (see recipe below) and a small amount of subsoil (a little clay in the mix is good because clay has lots of minerals). Additional soil, mostly subsoil, was mounded around each tree to prevent flooding. The forest garden: a seven level beneficial plant guild. Unlike most food forests, we started by planting our trees first since they take the longest to get established and because we wanted to speed things along as much as possible. We’ll add cover crops, soil builders and many additional plants over the next 2-3 years to complete the food forest. Eventually we’ll have all seven layers of a typical forest garden. We believe this is the best method for our tropical area, although it’s actually an experiment and we realize we may make some mistakes. Be sure to research the best methods for where you live. Old, composted materials are best if available. Optional: add one small bag (weight = 5 kilos) of quality potting soil or compost around root ball for most valuable trees. Important note for rainy climates such as ours: Tilling the top soil and adding lots of amendments such as rice hulls, straw, manure, coconut husks, etc. would create a thick porous sponge on the surface that would absorb and retain too much water and kill all the plants. Solutions for our climate include mounding soil around fruit trees to prevent waterlogging and planting one veggie plant here and there between trees. We’ve been told we have to build the soil gradually and wait for the trees to get strong before adding too much compost. Rant about how the food supply is very unhealthy and rapidly getting worse: The forest garden is the main reason we bought our land. I’ve primarily eaten healthy food since I was about 23, but now almost everything has junk in it. Many plants are GMO (some say around 80% of major crops), and most food is refined/processed/tainted in some way. Supermarket food is the worst, of course. But even healthy foods like vegetables in the farmer’s market are often grown with artificial fertilizers on dead soil lacking in minerals, sprayed with pesticides, and handled by workers with dirty hands. Also, many foods lose around 70% of their nutrients within the first day or two. Obviously it’s best to eat fresh from the garden. There’s no getting away from all these issues unless you grow your own food, so that’s our plan. We’ll also save a bundle of money and have better tasting food. Peaceful work in the garden is a bonus, which hopefully means I’ll be less likely to write rants like this in the future. Why is food independence more important than ever? Read this shocking article to find out. Read the article and learn why we should eat the wild/heirloom varieties and get 10x the nutrition, save money, plus they grow like weeds and are almost unphazed by plant pests and diseases. As most gardeners know, modern varieties can be real fickle. In summary, highly nutritious, easy to grow wild/heirloom varieties match the philosophy of forest gardening and organic gardening. They’re the perfect choice for anyone seeking a healthier lifestyle. This could lead to incredible health if you eat the plants fresh and mostly raw, and/or make smoothies because liquid nutrients are absorbed by your body much faster than nutrients from solid food. Great “new” venture Owen, to add to the other good work you have been doing for years. Free food, quality food! I am proud of you and your family for what you have done here. Thanks, Jerry. We just finished 9 new YouTube videos that document this homestead project. We’re uploading the files as we speak. The whole project has given me a boost of encouragement and self satisfaction. I’ve wanted to do something like this all my life and now we’re doing it. Here’s another example of how GMOs are spreading everywhere. I eat papaya almost every day. They’re super delicious. It really infuriates me to think they’ll soon be replaced with GMO varieties. 1. Free food forever! An established food forest with perennial and self-seeding annual plants is largely self sustaining. They require a lot of work to get started, but long term they keep producing food indefinitely with only minor inputs (pruning, etc.). 2. The taste of fresh grown organic food is light years beyond store bought and far healthier to boot. The local bananas for instance are very sweet and creamy (almost buttery tasting). Typical supermarket bananas in the US are totally different. They’re a result of careful planning by agro industry to maximize profits. Very nice and very thought out. Much luck to you and your family. GMO’s should be outlawed. I’m old fashioned and I believe if the Creator didn’t make it then I want no part of it. Yeah, I’m totally against GMOs. They’re totally unnatural and I sure don’t want to eat them. But like I said, GMOs are spreading into everything. Many processed foods already contain GMOs and people have no way of knowing. The “food safety” organizations (FDA) charged with protecting the public are largely working with giant corporations. Do the research. Look up the Harvard study (among dozens or hundreds of others) that convincingly shows that GMOs cause cancer. The only way to avoid all the nasty junk going into the food is to grow it yourself. I believe it. There’s a lot of evidence that points in this direction. Some call this ‘soft kill’. It’s a slow, gradual thinning of the population so as not to arouse too much alarm. Just one example — look at how cancer rates keep going up and up. And like you, I’ve read of possible cancer cures and yet nothing ever seems to come of it. The inventors get bought out, endlessly harassed or worse. Multinational corporations have grown so large and powerful that they can do whatever they want since they can buy off politicians and bureaucrats. I’ve been reading about this stuff for years and now I’m determined to be largely food self sufficient in the near future so I don’t have to eat their poison. One thing that fools many people is the effect of many different toxins. It’s easy to think “oh, it’s just a little bit”. Yeah, but it’s a little bit of poison in thousands of different products. There are chemicals in everything now — the air, water, food, vaccines, etc. The cumulative effect is very dangerous. I agree 100%. America has come to be a nation of “easy” meaning if it’s easy to cook up, turn on, sit in, drive in, dispose of. You know what I mean. They have grown lazy and think “Oh well…we’re all gonna’ die anyway” I call it the dumbing down of the American citizen. THIS is only one of many reasons I want to be way off grid growing and raising my food supply. Letting them remain in a coma. It’s going to heck in a hand basket here. From the Whitehouse on down. It’s only a matter of time before this Kingdom falls. The politicians won’t be able to borrow there way out of the mess they’ve created. It’s being destroyed from within. Are there YouTube videos in the works? Have you actually harvested and eaten anything from it yet? It often seems the first meal from a new (to you) plot of land or a new garden ends up being rather interesting/amusing as it often is something unexpected. I realize it’s probably too early to put in chickens, but did you plant trees that are designed to drop fruit to naturally feed chickens (such as mulberry), or do you have different chicken plans? Any bamboo? Either planted yourself, or already existing on the site? Reactions, comments, questions, from your neighbors would be very interesting as well. It might be fun to document some of them calling you crazy now, and hopefully document their thoughts and attitudes changing as the project matures. We planted the garden over the last six weeks, starting with the trees first. So no, there’s nothing to eat yet. Well, okay, we’ve eaten a few chilis come to think of it, but that’s all so far. It’s exciting watching how fast the plants grow. It’s almost like a dream now that the hardest part is finished. The banana plants, for instance, have already grown a foot or two and have new large leaves. We won’t have chickens until after several years. I’ve raised hundreds of chickens over the years and even though they’re the number one farm animal in my opinion, they are a lot of work and tend to tie you down. We’re just too busy for that sort of thing right now. All of our neighbors are farmers and understand perfectly what we’re doing. You see, the farms here are not endless stretches of rice fields. They are small farms with various types of trees, bamboo, orchards, gardens, etc. Our neighbor for instance is growing pumpkin, squash and pole beans before they plant their rice (in the same field). That’s called intercropping. Another farmer 50 yards away raised their land like we did and have all sorts of plants, fish ponds, etc. The only thing that raised any eyebrows was the earthbag pump house. They hadn’t seen one of those before! My question regarding chickens wasn’t whether or not you had any on the property at this time, but whether/how you may be planning ahead for that day. There are several general philosophies for different methods of raising them. Did you plant any trees with concept in mind that you plan on putting a chicken coop/run under the tree some day so that they can almost have a self feeding system? Perhaps you are considering a chicken tractoring concept for Zone1 instead? Lots of different ways to go about it. Those are perhaps the 2 most common methods. I was just curious about what direction you are thinking. I think you mentioned once that you have dogs. Have they been patrolling the site yet? Are they defending your plants from whatever burrowing critters you have in that part of the world that love to steal your hard work? Moles? Gophers? Voles? … Politicians? Chicken tractors are good for preparing the soil for forest gardens (as one example). But we didn’t want to spend years building the soil before planting trees. We wanted to get the trees started as soon as possible. At this point chicken tractors don’t seem practical for what we’re doing. We’re going to have loads of plants everywhere and that makes it hard or even impossible to move and set chicken tractors. This is a forest garden, not an orchard. Soon the garden will be dense with plants. If/when we get chickens, we’ll probably build a fixed chicken coop with very strong fencing on all sides and on the top. Over the years I’ve lost around 100 chickens to predators. Next time I will build it fortress-like from the beginning (buried chain link set in concrete, with chicken mesh on top…). Chicken feed: mostly plant wastes and weeds from the garden and scraps from the kitchen. We could let the chickens run loose during certain hours of the day once the forest garden is established. Our dogs are at our house in town. I’d love to let them run free on a farm. However, that may not happen any time soon. For one, they help protect our house. They’re our companions where we live. Plus, they are really active and destroy a lot of plants. It’s not practical to fence off all the plants on our homestead — plants are everywhere. As I’m sure you’re already aware. Properly trained, Dogs can be an important integral part of a Permaculture system. They can be great defenders of livestock as well as excellent predators of various rodents. Plus, they can make sure the ponds are completely cleared of stray sticks, tennis balls and other floating toys that happen to get thrown in. Who wants a pond full of stray tennis balls? We don’t have a pond or tennis balls. But our dogs are good at treeing politicians. That must count for something. Treeing politicians? How ’bout you bringing your dogs and my Bloodhound and we go on a road trip to D.C. They’ll love it there. Couple good ones but, most would be just good eating for them. Trouble is our dogs are just plain wild. They wrestle and race around our yard like wild animals. They terrorize local animals and chase motorcycles if they get out of the yard somehow. They’re often out of control and nothing we do seems to help. I sure wouldn’t want them to hurt the politicians. Your dogs just got my vote!! Excellent article! Looking forward to the progress. 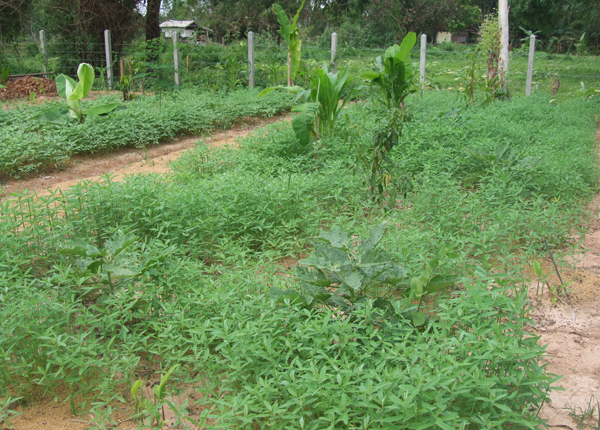 We are slowly developing a small plot outside Bangkok, and hope to have a forest garden too. Any plans to publish photos of the pump-house build? Glad to hear about your project. I’m hearing of more and more people planting forest gardens as opposed to just reading about them. The pump house will be covered in detail, because it’s a prototype emergency earthbag shelter. We have the photos. We’ll make a video soon. And eventually I plan to make a free builder’s manual with drawings, specifications, list of materials, tools and photos. It’s a beautiful garden, Owen. I’m quite envious of your efforts. I’m glad you are practicing vermiculture, they will help aeriate and fertilize the soil naturally. If you haven’t already, look into the many uses of biochar, as it also builds fertile soil, and has been used in the Amazon basin for well over 1000 years. Thanks. We haven’t built the earthworm bed yet. It’s on the list though. We added rice hull ash in every tree hole as explained in the recipe. That’s the same thing as biochar. We bought it at extremely low cost direct from the rice mill. The rice mill also sells rice hulls, which we used on our pathways and planting mix, and bran. Bran can be used to make bokashi, compost and fed to the earthworms. We also have access to sugar cane compost called bagasse. We’ll gradually add bagasse, straw, etc. to improve the soil. The small trees we planted six weeks ago are partially hidden by groundcovers that will build the soil and reduce erosion. On the right is Sunhemp (crotalaria juncea) and azuki beans on the left. They will be chopped and dropped when they start flowering. Every forest garden bed is different so we can learn what works best. Feel free to email me or leave comments if you have experience with this type of tropical forest gardening.